Planet-sized transmitters powering interstellar alien spacecraft in distant galaxies, scientists say! Mysterious flashes in space could be alien spacecraft at work, Harvard scientists say. 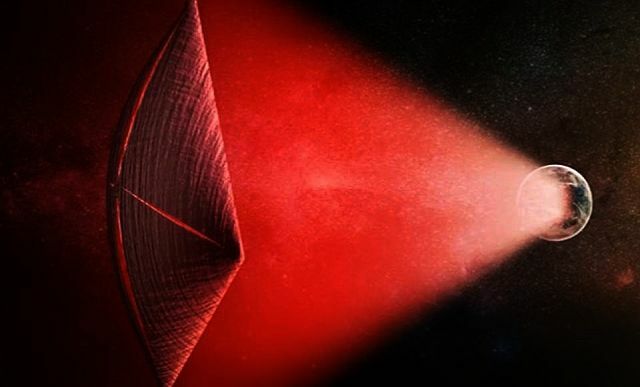 A newly published research suggests that mysterious phenomena called fast radio bursts could be evidence of advanced alien technology. Specifically, these bursts might be leakage from planet-sized transmitters powering interstellar probes in distant galaxies! "Fast radio bursts are exceedingly bright given their short duration and origin at great distances, and we haven't identified a possible natural source with any confidence," said theorist Avi Loeb of the Harvard-Smithsonian Center for Astrophysics. "An artificial origin is worth contemplating and checking." As the name implies, fast radio bursts are millisecond-long flashes of radio emission. First discovered in 2007, fewer than two dozen have been detected by gigantic radio telescopes like the Parkes Observatory in Australia or the Arecibo Observatory in Puerto Rico. They are inferred to originate from distant galaxies, billions of light-years away. Researchers at the Harvard University examined the feasibility of creating a radio transmitter strong enough for it to be detectable across such immense distances. They found that, if the transmitter were solar powered, the sunlight falling on an area of a planet twice the size of the Earth would be enough to generate the needed energy. Such a vast construction project is well beyond our technology, but within the realm of possibility according to the laws of physics.